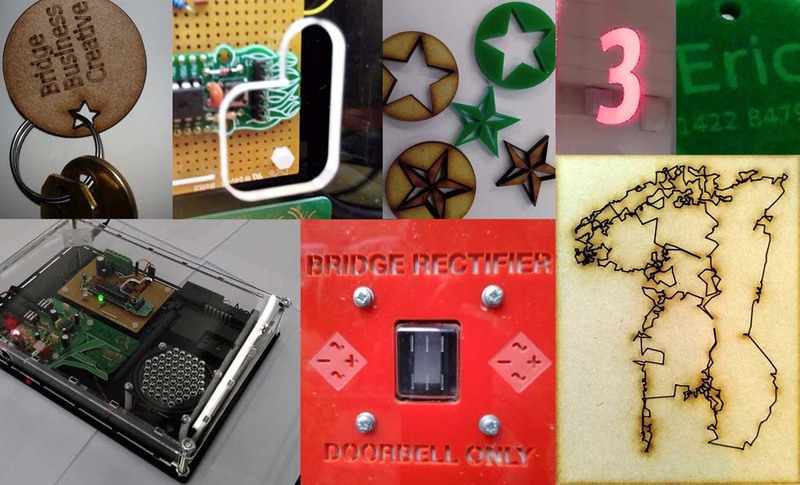 Free event at Bridge Rectifier – all welcome . . . .
mechanical components, special mountings, . . . .
Materials include: acrylic sheet, wood, cardboard, paper, . . . .
Hi. Could I book the lazer cutting on the 25th Feb for 3 people please. Could you please e-mail Carolyn via the address above as she is looking after bookings. Apologies, but we took bookings by email for Saturday 25th Feb, & hit our limit for the day. We’ve got a waiting list for the next session – possibly late April, but to be confirmed. Please contact carolyn@bridgerectifier.org.uk ASAP to get on the list. Hi I’m the treasurer of Hebden Bridge Folk and Roots Festival which is running from 12 – 14th of May this year. I have to provide beer and meal tokens to morris dancers and artists. Last year I just bought in simple paper tickets, but I’d really like something distinctive. I was wondering if I could learn how to use your laser cutter and produce something on it. I would probably need about 100 beer tokens and 25 meal tokens. So first, is this a feasible project? Secondly, would you trade training for an advert in our program or a couple of weekend tickets for the event? I’ll email you directly, Michael.